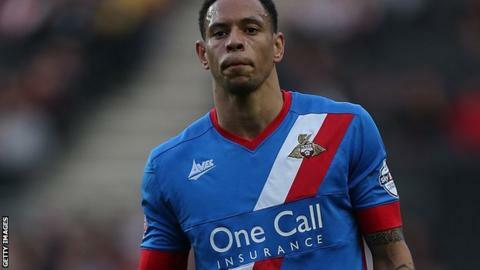 Nathan Tyson's hat-trick ensured Doncaster ended the season on a high with victory over Scunthorpe. Niall Canavan's own goal opened the scoring for Doncaster before Tyson headed Kyle Bennett's cross home. Rob Jones' glancing header made it 3-0 before Andy Butler's rebounded own goal put Scunthorpe on the scoresheet. Tyson convered two penalties to extend Doncaster's lead before Hakeen Adelakun's late free-kick gave Scunthorpe some consolation. "I'm glad it's all over and done with in all honesty. What it does, is it makes my decisions a lot easier. "I think when you look at the first half it was a non-event in a game where we brought over 1,500 supporters. "We've had great feelgood factor - you know, you want to go into the summer with a bit of momentum but we didn't turn up." Match ends, Doncaster Rovers 5, Scunthorpe United 2. Second Half ends, Doncaster Rovers 5, Scunthorpe United 2. Goal! Doncaster Rovers 5, Scunthorpe United 2. Hakeeb Adelakun (Scunthorpe United) from a free kick with a right footed shot to the high centre of the goal. Jack McKay (Doncaster Rovers) wins a free kick in the attacking half. George Evans (Scunthorpe United) wins a free kick in the defensive half. Substitution, Scunthorpe United. David Syers replaces Gary McSheffrey. Goal! Doncaster Rovers 5, Scunthorpe United 1. Nathan Tyson (Doncaster Rovers) converts the penalty with a left footed shot to the high centre of the goal. Penalty Doncaster Rovers. Harry Forrester draws a foul in the penalty area. Substitution, Doncaster Rovers. Reece Wabara replaces Mitchell Lund. Goal! Doncaster Rovers 4, Scunthorpe United 1. Nathan Tyson (Doncaster Rovers) converts the penalty with a left footed shot to the bottom right corner. Penalty conceded by Marcus Williams (Scunthorpe United) after a foul in the penalty area. Corner, Scunthorpe United. Conceded by Rob Jones. Substitution, Doncaster Rovers. Curtis Main replaces Kyle Bennett. Corner, Scunthorpe United. Conceded by Andy Butler. Attempt saved. Kevin van Veen (Scunthorpe United) right footed shot from the centre of the box is saved in the centre of the goal. Niall Canavan (Scunthorpe United) wins a free kick in the defensive half. Attempt missed. Niall Canavan (Scunthorpe United) header from the centre of the box is just a bit too high following a corner.